Scientists from ETH Zürich and EPFL have developed an ultra-light glove – weighing less than 8 grams – that enables users to feel and manipulate virtual objects. Their system provides extremely realistic haptic feedback and could run on a battery, allowing for unparalleled freedom of movement. Engineers and software developers around the world are seeking to create technology that lets users touch, grasp and manipulate virtual objects, while feeling like they are actually touching something in the real world. 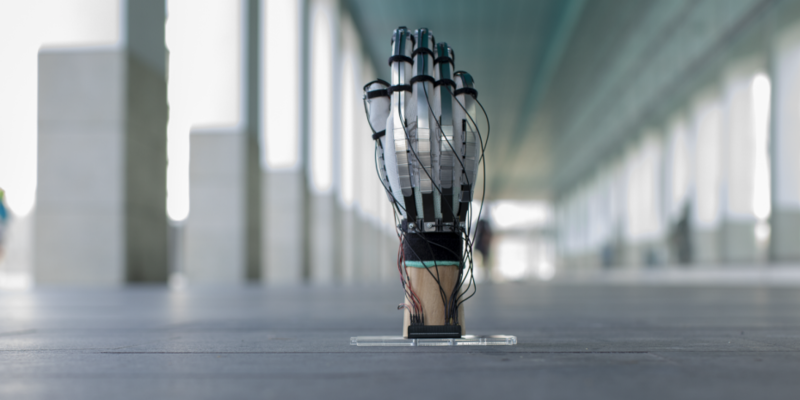 Scientists at ETH Zürich and EPFL have just made a major step toward this goal with their new haptic glove, which is not only lightweight – under 8 grams – but also provides feedback that is extremely realistic. The glove is able to generate up to 40 Newtons of holding force on each finger with just 200 Volts and only a few milliwatts of power. It also has the potential to run on a very small battery. That, together with the glove’s low form factor (only 2 mm thick), translates into an unprecedented level of precision and freedom of movement. “We wanted to develop a lightweight device that – unlike existing virtual-reality gloves – doesn’t require a bulky exoskeleton, pumps or very thick cables,” says Herbert Shea, head of EPFL’s Soft Transducers Laboratory (LMTS). The scientists’ glove, called DextrES, has been successfully tested on volunteers in Zürich and will be presented at the upcoming ACM Symposium on User Interface Software and Technology (UIST). DextrES is made of cotton with thin elastic metal strips running over the fingers. The strips are separated by a thin insulator. When the user’s fingers come into contact with a virtual object, the controller applies a voltage difference between the metal strips causing them to stick together via electrostatic attraction – this produces a braking force that blocks the finger’s or thumb’s movement. Once the voltage is removed, the metal strips glide smoothly and the user can once again move his fingers freely. In this joint research project, the hardware was developed by EPFL at its Microcity campus in Neuchâtel, and the virtual reality system was created by ETH Zürich, which also carried out the user tests. “Our partnership with the EPFL lab is a very good match. It allows us to tackle some of the longstanding challenges in virtual reality at a pace and depth that would otherwise not be possible,” adds Hilliges. The next step will be to scale up the device and apply it to other parts of the body using conductive fabric. “Gamers are currently the biggest market, but there are many other potential applications – especially in healthcare, such as for training surgeons. The technology could also be applied in augmented reality,” says Shea..